Chelsea week is drawing to an end and this year at the Flower Show, 90% of the flowers in the Floral Marquee have been grown in Britain. Getting flowers with different flowering times such as Tulips, Daffodils, Sweet peas and Alliums to be in peak condition for this week is a herculean effort and you can read more in this excellent post by the Physic Blogger. Marks and Spencer gained a Gold medal for their 'Blooms of the British Isles' exhibit and are selling lovely Chelsea bouquets featuring Stocks, Alchemilla mollis and Allium 'Purple Sensation'. At a price tag of £30 though, you could use that money to buy some annual seed and grow, not just one bouquet, but 2-3 vases full of flowers each week all through the Summer. So, why not get inspired and try your hand a growing your own British blooms this year? May is a great time to direct sow annual flowers outside and if you sow now, you could be harvesting your own flowers in 8-12 weeks. You just need some spare soil - weed-free, sheltered and in the sun. Just follow the instructions on the back of the seed packets and keep an eye out for slugs. Check out my first Cutting Diary article for more information. This time last month, I had just planted out my first batch of hardy annuals in one of the 3 raised beds in my cutting garden. They're putting on growth quickly now and I'm eagerly anticipating flowers in about 3 weeks. That's Cornflowers, Amberboa muricata 'Sweet Sultan', Malope trifida 'Vulcan', Ammi majus, Bupleurum rotundifolium, Larkspur 'Stock flowered mix', Lupinus 'Snow Pixie' and Orlaya grandiflora. I am just hardening off a second sowing of Ammi and Bupleurum which I sowed due to poor germination the first time. I'll plant them at the end of this week and they'll soon catch up with the first batch. My half-hardy annuals (Cosmos, Sunflowers, Zinnias, Carnations, Chrysanthemums and Panicum grasses) are all a good size and have been moved from the house into the potting shed so I have clear window sills for a change). I've pinched out the growing tips on the Cosmos, Sunflowers and Zinnias to prevent them getting too leggy and to produce sturdier plants. I will start hardening these off next week for planting out at the end of the month when I can be sure that all danger of a late frost is over. Even though the plants in my first bed are still fairly small, I have already added individual stakes for the taller annuals - a mix of bamboo canes, birch branches and rustic metal hoops. When the plants grow taller, I will tie them in with jute twine. It is best to stake sooner rather than later as firstly you won't damage established root systems when pushing in the stakes and if you leave it too late you may find that a Summer wind can quickly snap the stems of tall plants like Cornflowers and Cosmos. 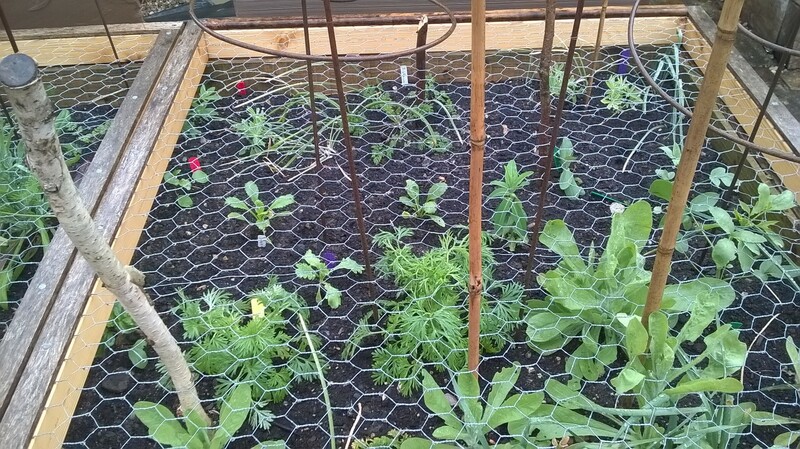 The removable chicken wire mesh frame will add a small degree of support for the plants (it's at a height of about 15 cm above the soil) but it is primarily a cat deterrent. We have our own cats and a lot of neighbourhood cats that see a raised bed and think it would make a nice toilet - sorry if this is too much information, but there's nothing worse than encountering buried treasure when you are planting your seedlings! 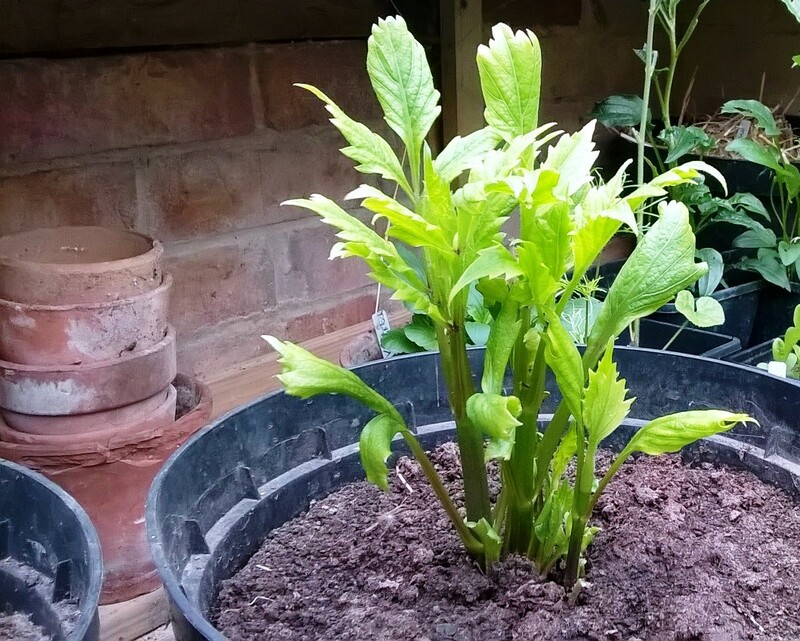 I potted up my dahlia tubers in early April, some in large terracotta pots where they will stay and a couple in large plastic pots as they will be transferred into a raised bed when space is freed up at the end of July. 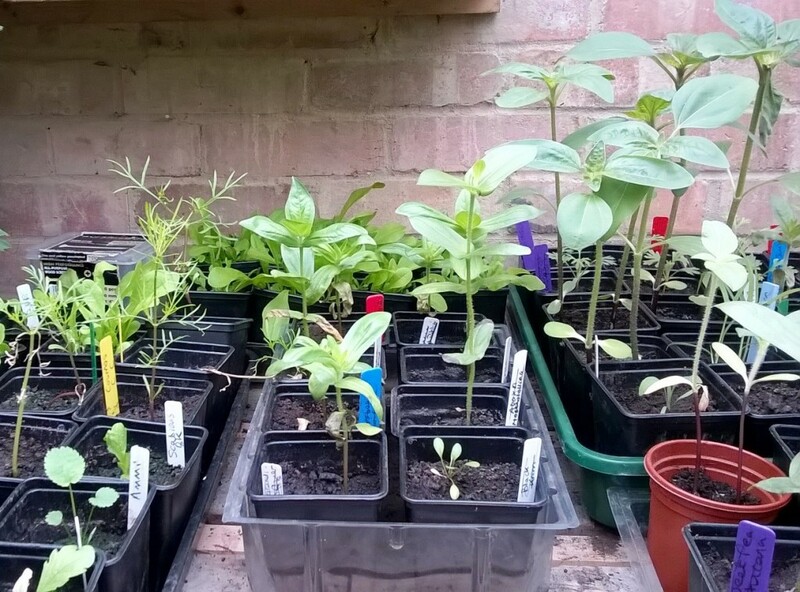 Some are already producing leafy growth, but I will keep them in the potting shed until all danger of frost is over, keeping them in the light and in moist compost. One Dahlia tuber will produce lots of flowers as long as you just keep picking them. This year, I'm growing the lovely dark red, cactus flowered Dahlia 'Nuit d'ete', 'Sam Hopkins' a dark red form, 'Roxy' with a simple, magenta flower and 'Blue Bayou', an anemone flowered form with lavender outer petals and deep purple pin-cushion centres. I will be planting 2 Dahlias in the raised bed that is currently home to my half-hardy annuals which will flower from June-July. In this way, this one raised bed will have housed 3 separate crops from February until October/November - first, early flowering bulbs - Daffodils & Iris reticulata, followed by my first batch of half-hardy annuals, and then the Dahlias, along with Carnations 'Giant Chabaud mixed' (a half-hardy perennial which can be treated as an annual) and Chrysanthemums 'Polar Star' - beautiful tricolour flowers with each white flower having an inner yellow halo surrounding a darker, central cushion. 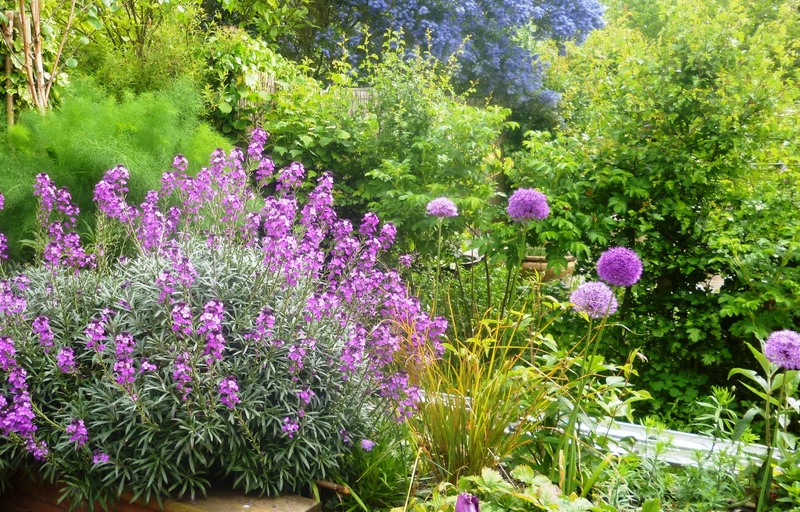 May and June are good months to sow biennials such as Sweet Williams, Sweet Rocket and Honesty. These will put on growth this year and flower early next Spring. This may all seem a bit of a faff as you have to wait for flowers, but they are all worth growing as they provide flowers early in the season before Spring sown annuals have started flowering. If you let some go up to seed, they will self-seed and you can lift the seedlings and arrange them into orderly rows where you would like them without needing to sow again. I missed the boat last year with mine so will ensure I grow a few of each in the potting shed once I have planted out all the annuals at the end of this month and there is space for some new pots. It's hard to narrow it down to just 10 but these are my favourite annuals to grow for cut flowers. It's important to choose a balance of colours, flower shapes and foliage when deciding which annuals to grow in your patch. Ammi majus, Bishop's flower - a delicate, creamy-white umbellifer similar to Cow Parsley with attractive fern-like foliage. It's a great filler to add frothy bulk to an arrangement and to set off other flowers. Flowers from mid-Summer to mid-Autumn. Cornflowers, Centaurea cyanus - Brings a relaxed, naturalistic feel to a vase. This lovely native flower used to grow in abundance on arable land. The deep blue flowers are easy to grow and can be sown in Autumn for early flowering next Spring. 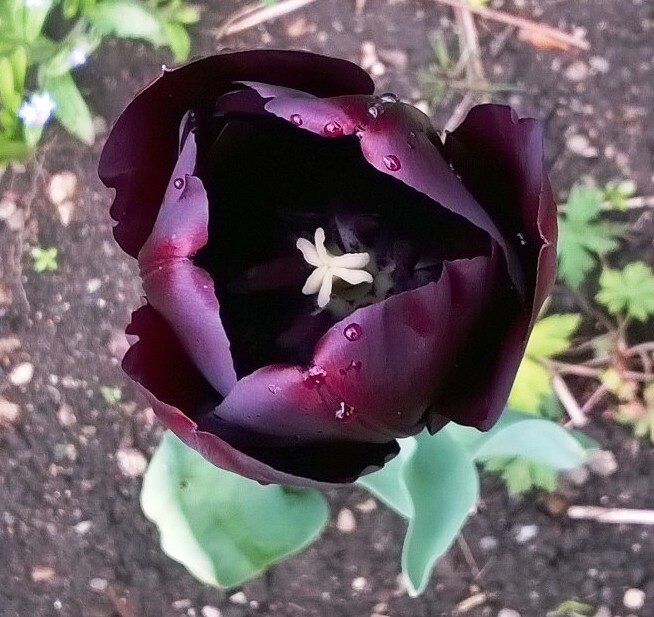 As well as classic blue, I recommend 'Black Ball', a dark, red wine colour. Flowers from early Summer if sown in Spring. Scabious, Scabiosa atropurpurea - Prolific flowerers from early Summer until the Autumn frosts. The flowers are long-lasting and are a great plant to grow as they also look attractive at the bud stage and at the seed head stage. Let some flowers go to seed to take advantage of this. I grow 'Tall Double Mix' which has a mix of pinks, whites and crimsons but I also like the dark red 'Black Cat' variety and 'Ping Pong' has blue flowers and amazing sculptural seed heads. Larkspur, Consolida ajacis - Useful tall spires of flowers to add height to your vases. It's similar to a Delphinium but smaller with more delicate foliage and flowers more prolifically. I'm growing 'Stock flowered mix' this year which has a blend of colours ranging from light pink to dark purple. Flowers in late Spring from an Autumn sowing or early Summer from a Spring sowing. Love in a Mist, Nigella damascena - A classic cottage-garden flower with lovely fennel-like foliage. It has gorgeous seed pods which can be used later in the season. I grow it scattered throughout my perennial borders where it self-seeds into any gaps. 'Miss Jekyll' is a classic blue, 'Persian Rose' is a delicate pink. Cosmos, Cosmos bipinnatus - Very easy to grow and produce hundreds of flowers. There are a range of pinks and crimsons to pure white forms. Flowers from mid-Summer to the first frosts. I grow 'Purity' for its simple white flower which adds elegance to a vase and, for something a little different this year, I'm trying 'Click Cranberries' which has more layers of petals with raggedy edges and a deep red colour. Euphorbia oblongata, Eggleaf spurge - like Ammi, this is invaluable to grow as a filler for your arrangements. Bright, greeny-yellow flowers offset darker flowers beautifully. As with all Euphorbias, the sap is a skin irritant so wear gloves when harvesting. Zinnias, Zinnia elegans - These natives of Mexico come in a range of rich, bright cheerful colours and will flower from late Summer to mid-Autumn. I've grown 'Giant Dahlia' mix in the past which produces a mix of colourful flowers but this year I'm trying 'Yoga' and 'Art Deco'. The lime-green 'Envy' is a little temperamental to grow and I haven't found that it has flourished as well as some of the other varieties. Sunflower, Helianthus annuus, H. debilis - Bright, cheerful flowers that are easy to grow and loved by children. 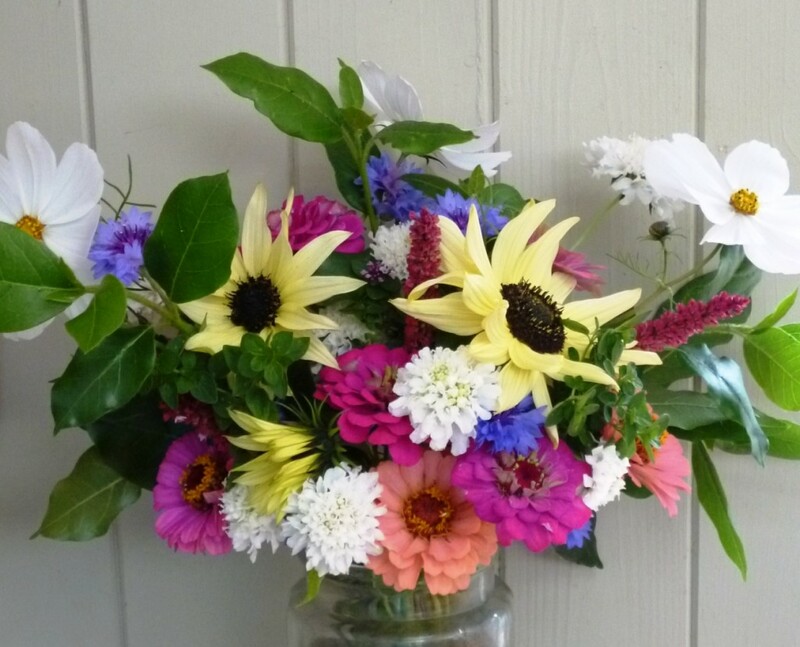 Big flower heads look great on their own in a jug but they can be hard to combine with other flowers. I grow Helianthus debilis 'Vanilla Ice' (hard not to sing 'Ice, Ice baby' every time I think of this one!) which produces an abundance of smaller pale yellow flowers that combine beautifully with other blooms. Flower from Mid-Summer to Autumn. Sweet peas, Lathyrus odoratus. The individual flowers may not last long once cut but these climbing annuals produce so many flowers over a long period and have some of the best scent of any flower. They come in so many colours, you are spoilt for choice. I go for ones that smell as good as they look such as 'Matucana'. Flower from late Spring into Autumn. A taster of which plants you could be cutting this month from your garden. It is possible to design your beds and borders to include a plethora of flowers for cutting without affecting the display in the garden. All the plants make great garden plants in their own right. 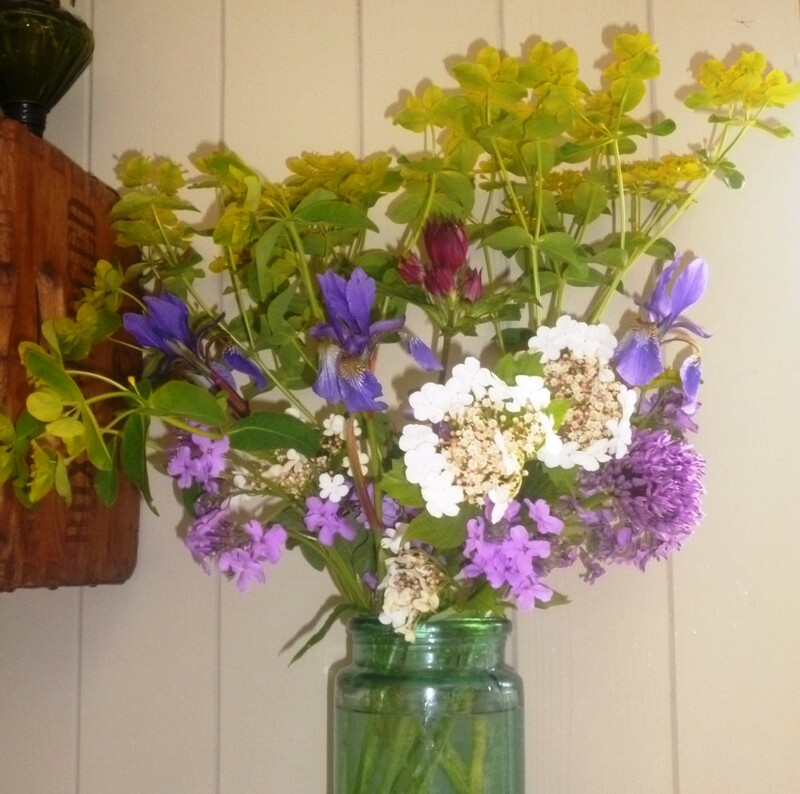 Just a few flowers of each type make a lovely arrangement and many of the plants are also brilliant for wildlife. 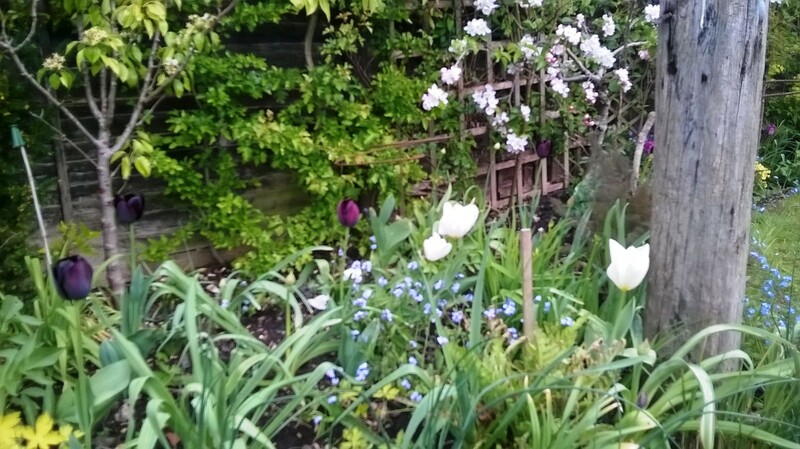 I have Tulips scattered throughout my garden beds but just pick a few stems here and there (in addition to a dedicated raised bed which I treat as a crop). Plant double what you need in the border and you will have extra flowers to cut for indoors as well as a great display in your beds. If you choose a mix of early, mid and late flowering forms, you can harvest flowers from March to May. Tulips flower best in their first year but you can select varieties that are better at repeat-flowering than others. I've grown Purissima, a white form which flowers in mid-Spring which is just starting to go over, Queen of Night (very dark purple) which started to flower towards the end of April and is looking great in May, 'Negrita' a lighter purple looking good in early April and Black parrot with it's dark colour and lovely frilly edge flowering in late Spring which is still looking good. All of these are supposed to be good repeat flowerers, although as this is their first year, I will have to report back next Spring. We planted over a hundred Allium bulbs the Autumn before last and it has really transformed our beds in May and June before most of the perennials come into flower and after most of the Tulips have done their thing . As there are so many, I can pick a few at a time for cutting without much impact on the garden. I have a mix of A. 'Purple Sensation' with its large, rounded purple pom-pom head, A. 'Cristophii' which has large, fire-work heads of star-shaped, purple flowers, A. Nigrum - a lovely white form and lots of the smaller, round-headed A. sphaerocephalon which flower later in July. 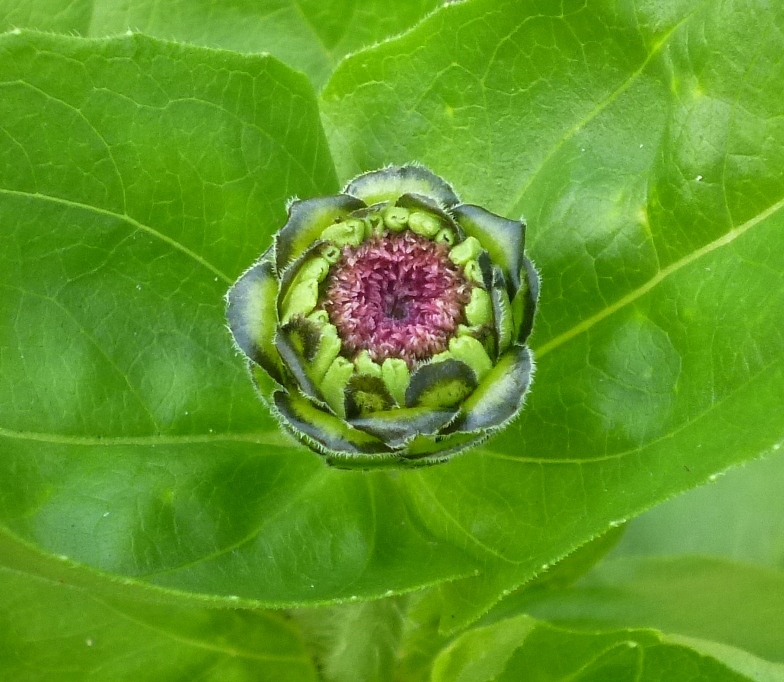 These started flowering in early April but are still popping up and looking good, especially on the shady side of the garden when flowers appear slightly later. They are wonderful flowers for mixed Spring posies. Lovely Spring flowers which come in range of colours and forms. I have a mix of dark purples and pinks dug up from my mother-in-law's garden. They self-seed and you will find lots of little seedlings throughout the garden which are easy to either weed out or transplant to where you'd like them. A great foliage plant and a lovely zingy, acid green which looks good with dark Tulips and with colourful Spring flowers. There are many different forms of Euphorbia, both annual and perennial. I grow Euphorbia amygdaloides v. robbiae which is an evergreen perennial. It looks great in my border year-round and is invaluable as it thrives in partial and full shade. A classic native British flower which thrives in shade. I inherited a small clump growing around the base of a Silver birch in my garden. A few flower spikes cut just as the bottom flowers are emerging adds a lovely dimension to a Spring flower display. You should never cut Bluebells growing in the wild but do go and visit a bluebell wood in May for a spectacular display. If you do add Bluebells to your garden, ensure you plant our native Bluebell rather than the Spanishone as our native species is under threat. These both flower this month and are useful shrubs with wonderful creamy-white flowers. I have both growing as part of a mixed native hedge. A hedge is a great source of both foliage and flowers for arrangements if you don't have much room to grow shrubs in your beds. Both species will produce red berries in Autumn which are useful for adding colour to Christmas wreaths or Winter vases. 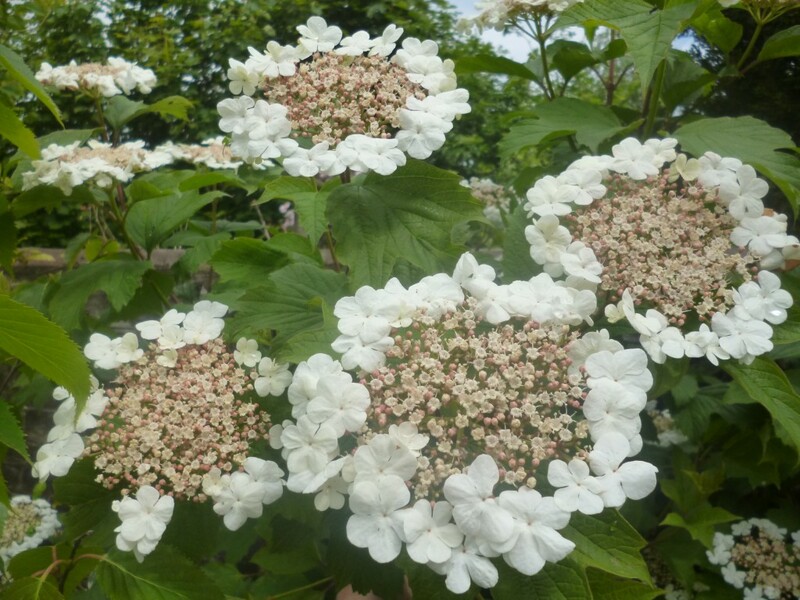 Viburnum oplus (Guelder Rose) with its gorgeous flat clusters of flowers. We have this perennial wallflower in a raised bed near the house and it flowers off and on all year round with perfumed mid-purple flower spikes which swarm with bees and butterflies in the Summer. They are one of the very best nectar supplies for insects as they have such a long flowering period so everyone should grow one for the bees and snip a few flowers for yourself too. Just 3-5 stems in a vase will add a pop of vivid colour. This is a wonderful perennial herb. It smells divine, makes a yummy herbal tea and it has lovely fresh green foliage in May. The new growth is a bit soft and sappy at this time of year but if you sear the stems it will last quite nicely. A biennial which, if you sow seed in late Summer and plant out in September, will be flowering now. Comes in purple or white forms and flowers profusely. It will self-seed which is great if you want a lot of it, otherwise, keep cutting the flowers and it won't ever get to the seed stage.